Fitting metal frets to your cigar box guitar enables you to play finger picking styles along with the slide chords. The frets also act as a visual guide to the placement of the slide. Frets are strips of metal with a “tang” that presses into a groove or slot cut in the neck. These grooves or slots must be accurately cut so that the scale length is precise and the cuts are perpendicular to the long side of the neck. The Tonetech Cigar Box Guitar kits are supplied with the scale laid out. All you need to do is cut the slots on the fret markers and hammer in or press the frets home. If you want to choose your own scale, you will find lots of fret calculators in the internet. Each fret must be pressed or hammered into the fret slot so it is completely bedded down. 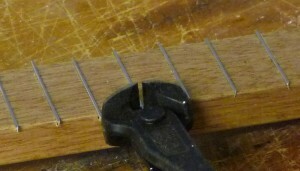 The ends of the frets must be snipped off flush with the neck and then filed smooth. Use a small file to round the ends of the frets so they don’t catch on your hand as you slide up and down the neck.